"Funding U.S. 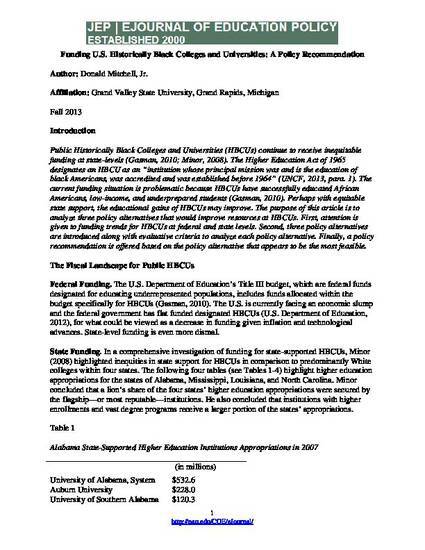 Historically Black Colleges and Universities: A Policy Recommendation" by Donald Mitchell, Jr. Selected Works of Donald Mitchell Jr., Ph.D.
Public Historically Black Colleges and Universities (HBCUs) continue to receive inequitable funding at state-levels (Gasman, 2010; Minor, 2008). The Higher Education Act of 1965 designates an HBCU as an “institution whose principal mission was and is the education of black Americans, was accredited and was established before 1964” (UNCF, 2013, para. 1). The current funding situation is problematic because HBCUs have successfully educated African Americans, low-income, and underprepared students (Gasman, 2010). Perhaps with equitable state support, the educational gains of HBCUs may improve. The purpose of this article is to analyze three policy alternatives that would improve resources at HBCUs. First, attention is given to funding trends for HBCUs at federal and state levels. Second, three policy alternatives are introduced along with evaluative criteria to analyze each policy alternative. Finally, a policy recommendation is offered based on the policy alternative that appears to be the most feasible. Contact Donald Mitchell Jr., Ph.D.